I first came across Sinduri or Shendri in a book of Indian trees. 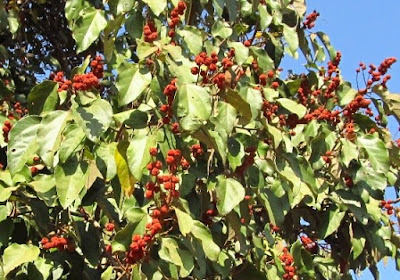 The very red fruits looked so attractive that from then onwards I had this tree on my must-see list. Got the opportunity very recently to see it in Pachmarhi. Mallotus philippensis is a plant in the spurge family. 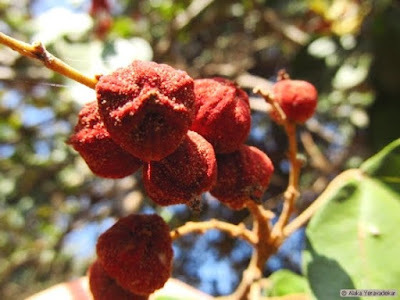 It is known as the kamala tree or red kamala or kumkum tree, due to the fruit covering, which produces a red dye. This kamala often appears in rainforest margins. Or in disturbed areas free from fire, in moderate to high rainfall areas. It occurs in south east Asia, as well as Afghanistan and Australia. The southern most limit of natural distribution is Mount Keira, south of Sydney. The species name refers to the type specimen being collected in the Philippines, where it is known as banato. crimson rose (mating), peacock pansy, great orange tip, joker..
more from the same place.. Sum of many parts. Voracious reader, avid birdwatcher, love traveling, trekking, enjoy music, sketching, painting, and occasionally blog on food. My poetry and non-fiction have been published in print and on the web.